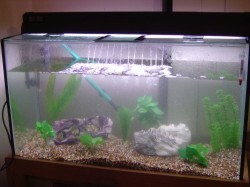 Aquarium Setup - How It Is Successfully Achieved? 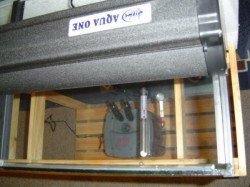 Your aquarium setup should not be a stressful experience either for you or your fish. 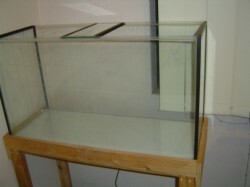 I'm describing the setup of a freshwater aquarium here that would house either goldfish or freshwater tropical fish. Note: If it is a goldfish setup you don't need the water heater as shown. I am not a professional aquarist or dealer. By following these guidelines you do so voluntarily and at your own risk. I disclaim any and all problems or difficulties arising from the setup of your fish tank. 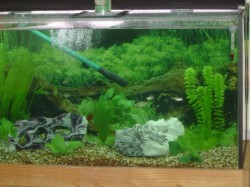 Additionally you'll need gravel, some decorations such as rocks etc and some plants. Actually, I put in a small amount of water and a few rocks after washing the gravel thoroughly. It is really important to wash the gravel because there are often impurities in it that can create problems in your water quality later down the track. While we're on the subject of water quality don't forget this vital step for your aquarium setup...de-chlorination. You must de-chlorinate the water you put in your tank because if you put in straight tap water your fish will be dead within minutes. Yes, chlorine is deadly for fish. Additionally, your water may be contaminated with traces of heavy metals which are also detrimental to aquarium fish health. There are many good products on the market and your local pet store or aquarist should be able to advise you on the right one for you. Now comes a really important part of your aquarium setup. You must let the tank develop its own "bio-filter". This is the growth of the right bacteria within the fish tank setup to make it less stressful but more healthy for the introduction of your aquarium fish. I use a product called "Stability" by Seachem to help with this stabilization of my new tank. This liquid helps establish bacteria in your aquarium setup and helps you to avoid what they call "new tank syndrome" or in other words...the death of all your new fish! The bacterium that is in this product helps with the breakdown of ammonia, nitrite, nitrate and toxic hydrogen sulfide. All these elements can be detrimental even deadly for your fish. I actually let the water "stand" for at least 7 days, adding the Stability liquid on a daily basis as per the instructions. Yes that's right...7 DAYS! Only then are you ready to add your precious fish. To add them too quickly is not only wrong, it is cruel. Remember, they are living creatures who deserve your respect and will definitely need your diligence and care. So don't be too eager to get the fish in quickly because you'll have a lot more success AND enjoyment with a little patience. Now it's the fun part. It's time to add fish to your aquarium setup after waiting the mandatory 7 days. Oh! I almost forgot. During this time (the 7 days) I test the water on a daily basis to make sure that it is the right pH value, doesn't contain ammonia etc and is the right temperature for the introduction for your fish. Obviously, I can't state what that is here because these factors will change slightly with the different type of fish you introduce into your tank. Try to choose fish in your aquarium setup that are compatible both in terms of their temperament and tolerance of the same water qualities. Now back to adding the fish. When doing so you need to be careful again. Careful because if you release your fish into the tank water too quickly they can become stressed and die. Yes, they are a little difficult but if you do things the right way the first time you should get a lot of enjoyment out of your fish. When you buy them from the aquarium shop or pet store they'll usually put them in a plastic bag and add a little air to help the fish with the journey home. When you arrive home, place the plastic bag in the tank water UN-OPENED for at least 15 to 20 minutes so that the fish are acclimatized to the water temperature in your tank. After this you open the plastic bag but DO NOT release the fish. Just add a small amount of water from the tank water into the bag and wait another 15 minutes or so. I repeat this step one more time adding the same amount of water into the bag as was in their before you opened it. In other words there is now 2 times the water in the bag as when you brought the fish home. I wait another 15 minutes and then release my fish into the tank. After doing it this way you should get fish that are much less stressed and have a much greater chance of survival in their new environment. Here's a little tip on the plastic background. It goes on the outside of the back of the tank of course but instead of taping it to the glass you can smear a little petroleum jelly around the edge of the plastic and it will adhere to the glass superbly. I've had mine on the tank now for several months and have not had to add any more petroleum jelly at all. 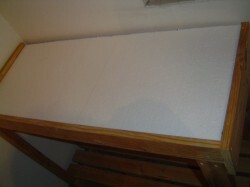 I enjoy my fish tanks everyday and I hope you got something out of this page and will enjoy your own fish tanks soon.